Folks tend to flock towards the Beach Boys’ Pet Sounds, The Zombies’ Odyssey and Oracle, Love’s Forever Changes and the Kinks’ Village Green Preservation Society due to history anointing them as the touchstones of late 60s psych-pop. However, this era was rife with albums that fell just short of the brilliance of these classics. This was such a fertile period for the genre and bands like the Hollies, Bee Gees, Sagittarius, Flaming Groovies recorded great works that are somewhat forgotten in the glow of these anointed favorites. 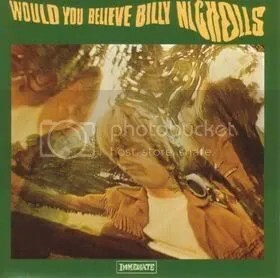 One of my favorit also-rans from this period is Billy Nicholls’ Would You Believe as it borrows bits and pieces from the big three, but it buries its melancholy sentiments beneath uplifting harmonies, carefully orchestrated arrangement and the occassional bluster of a raucous riff. Nicholls’ songs are great on their own, but much credit must be paid to the influence of Andrew Loog Oldham, producer of the Rolling Stones, manager of the Small Faces and head of the Immediate label. He is responsible for the lush backing of Would You Believe’s most memorable songs. In fact, his production works so well because the incessant positivity of these arrangements conflicts with some depressing sentiments. I’ve always been a sucker for sour notes dolled up in fancy clothing, so I tend to favor the tunes where Billy smiles to hide the tears.What is even more amazing is that much of the album was created while he was 16 years old and that the Small Faces provide backup on some of the tracks. Supposedly, Oldham viewed Nicholls’ as a potential cash cow that he could mold into a British Brian Wilson to serve as a bookend to Mick Jagger, but it didn’t quite work out that way. Anyone who can pen such a slice of sunshine like “Life is Short” is ok with me. The entire song revolves around a innocent obsession where the “ba-ba-ba’s” mask the desperation of a young man obsessed with a woman who won’t give him the day. He gets so caught up in the fact that life is transient and get so worked up about the pursuit that I almost want to chase behind that waggish scamp. His romanticism constantly gets the better of him and the result is a song like “It Brings me Down” which documents his angst in sublime fashion as piano, guitar, harpsichord and drums collide in a fruity manner that celebrates the orchestral excess of the time period. Plus, the instrumental coda at the end of this song is a perfect way to go out as it backwards tracks its way to Beatledom. Nicholls became disilluisioned with the album’s lack of success, broke with Oldham and recorded a couple solo albums that I’d love to hear. It is a shame because the optimistic moments hint at a bright future that was never fulfilled.